The name Kuwait comes from the Arabic words “akwat” and “kout”, which translates to “Fortress built near water.” Kuwait is a small emirate on the Arabian Peninsula, located in the northwestern corner of the Persian Gulf. Her neighbors are Iraq to the northwest, Saudi Arabia to the south and the Persian Gulf to the east. This country is tiny in size, but one of the richest on earth. The country is run as a constitutional monarchy that the ruling family, Al Sabah, established back in 1756. What began as a small trading fort, has grown to be one of the most urbanized countries in the world. Kuwait, in addition to the mainland, comprises nine islands, only one of which is inhabited, called Failaka. Mesopotamians first settled on this Kuwait island back in 2000 B.C. The inhabitants were among the world’s earliest maritime traders. The island was also once occupied by Alexander the Great. In the eighteen century, Kuwait enjoyed rapid prosperity and became the principle commercial center for the transit of goods between India, Muscat, Baghdad and Arabia. Kuwait was also the center for ship building in the Persian region. Their vessels were renowned throughout the Indian Ocean and they soon developed a reputation as the best sailors in the Gulf. They also operated a significant pearl harvesting industry. Kuwait is a low lying, arid land, with a desert climate. It is extremely hot and dry in the summer, which is long, and temperatures range from 108 to 118 degrees Fahrenheit. Winters are short and can get colder than other Gulf country, due to its northern exposure. The desert land is mainly sandy and barren. They suffer from frequent sand and dust storms throughout the year, but they are most prominent from March to August. There are no lakes or rivers in Kuwait. There is also very little rainfall, only 2 to 6 inches per year. Kuwait gets almost all of its water for drinking and domestic purposes from their large and sophisticated desalination plants. The first plant was established in 1953. The water is stored in 33 different towers known as the “The mushroom towers,” named for their unique mushroom, shape design. Each tower holds 3000 cubic meters of water. They are strategically placed throughout Kuwait City and serve as landmarks for their districts. The design is so unique that it won the Aga Khan Award for Architecture, in 1980. Kuwait supported Iraq during the Iran-Iraq war, yet in 1990, Saddam Hussein tried to annex Kuwait with an invasion. His regime was upset that Kuwait was flooding the market with oil and driving the price down. A US led United Nations’ coalition was formed that drove out Iraq, and the war was ended in 1991. February 26th is celebrated as Liberation Day. However, the effects of war on Kuwait were horrendous. Many of the oil fields were set on fire and it took time and effort for Kuwait to return to prosperity. The oil reserves in Kuwait account for ten percent of the world’s oil and nearly all of Kuwait’s GDP. Although Kuwait has tried to diversify to be less dependent on the oil revenue stream, it remains dependent even today. They do have a vigorous shipping industry, as well as financial services, but oil is their main income. The Kuwaiti dinar is the highest valued currency in the world. The Kuwaitis are generous in foreign, economic assistance through the Kuwait Fund for Arab Economic Development. They also have a sovereign wealth fund which has directed investments into the United States, Europe and Asia, where holdings are estimated to be $592 billion, in assets. They are considered to be one of the more progressive Middle Eastern countries regarding free speech and women’s rights. Although they have a ways to go, women were given the right to vote and to run for elections, back in 2005. Authorities in Kuwait monitor internet communications and block content deemed offensive. Press laws prohibit any references against God, the Koran, the Prophet Mohammed and the Emir. The nation is made up of less than half Kuwaiti citizens, as it has a massive immigration problem. Many people have sought Kuwait as a place to work and live, due to its incredible wealth. It is the fourth richest nation in the world. Being a Kuwaiti citizen has many financial benefits. They are given an allowance from birth with free education through college. They will often pay its citizens to study at universities in other countries, which includes room and board. Housing is also subsidized, if not free, as well as healthcare. This causes a rift between the immigrants and those who are considered citizens, as the rules to become a citizen are very difficult and this has created instability within the government. The ethnic makeup of Kuwait is 60% Arab; Indians and Egyptians are the largest expat communities, with Iranians and South Asians making up most of the balance. The main religion in Kuwait is Sunni Muslim, with some Shi’a and other religions in the mix. Alcohol is illegal in Kuwait and pork is not consumed. Arabic is the official language and English is taught as a second language. 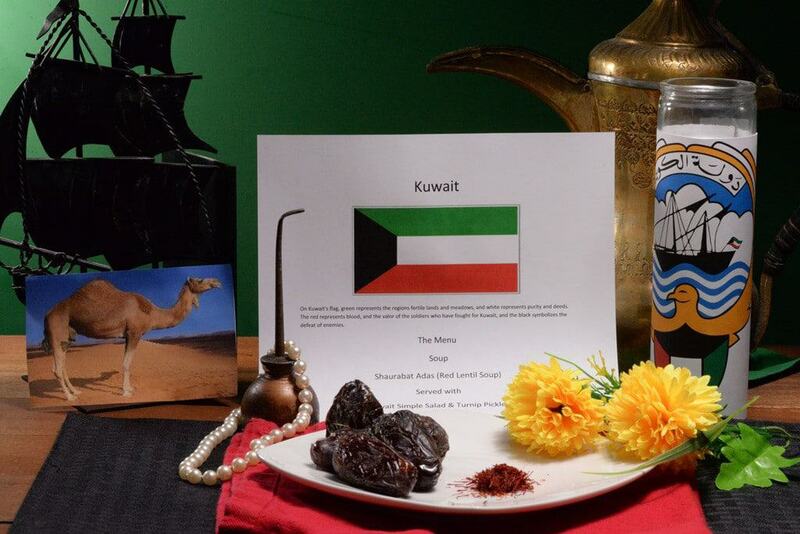 As we look into the cuisine of Kuwait, it is influenced largely by the wealth of the nation. Due to the arid dessert landscape and lack of water, not much grows in Kuwait. They do grow some grains, fruits and nuts but other imports are prevalent. Nearly all international types of cuisine can be found in the capital of Kuwait City. However, it is the Arab Gulf cuisine that is considered Kuwaiti cuisine, with influences from Arabian, Persian, Indian and Mediterranean cuisines. Lamb, beef and chicken are all readily available and usually served with basmati rice that is flavored with baharat, an Arabic spice blend. Soups and salads are served with most meals, as well as khubz, an Iranian flat bread. Fish and seafood are also a mainstay as they are located on the Gulf. The typical spices, aside from baharat, are coriander, cardamom and saffron (the most expensive spice in the world.) Machboos is considered the national dish. 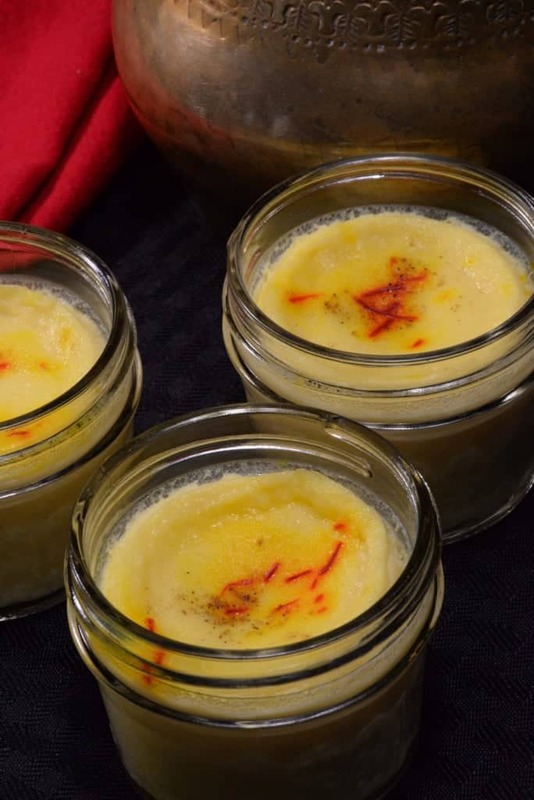 (We made machboos to represent Bahrain and the delicious recipe can be found under that country.) Interestingly, they have an obesity problem in Kuwait, ranking eighth in the world. Perhaps it is due to the serving size; Kuwaitis are known to always serve an abundance of food. We decorated with the colors of the Kuwait flag; green, white, red and black. Little yellow flowers were strewn about, representing the national flower, the Arfaj. We added pearls, to symbolize a robust pearling industry, a ship, signifying their shipping talents and an oil can, denoting their wealth. The coat of arms, featuring a falcon (their national bird) and a camel (their national animal), was also included. Dates and saffron strands completed the scene. Our first course was a tasty, red lentil soup, common to the Arabian Gulf. The soup was flavored with baharat, coriander, turmeric and loomi, (A dried black lime that imparts a unique flavor to Arab cuisine.) 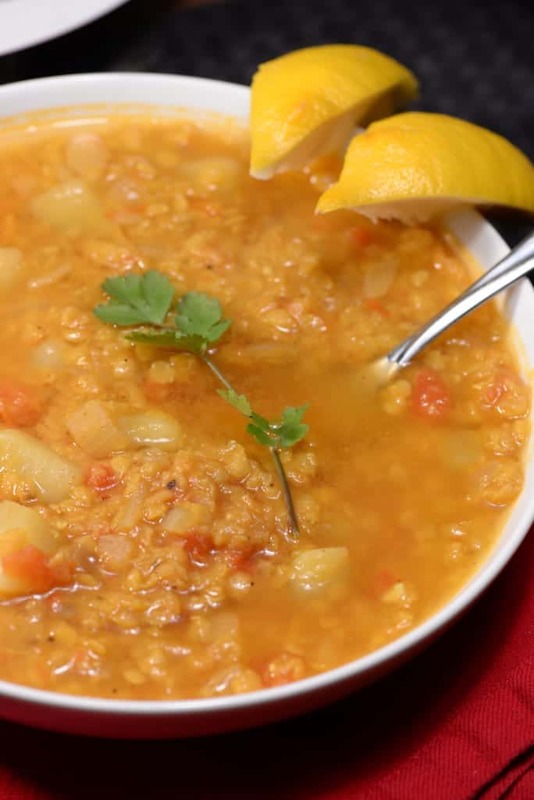 Lentil soup is hearty and could easily be a meal by itself, with a little flat bread. It is best served with a squeeze of fresh lemon juice. Our next course was a Kuwaiti simple salad. 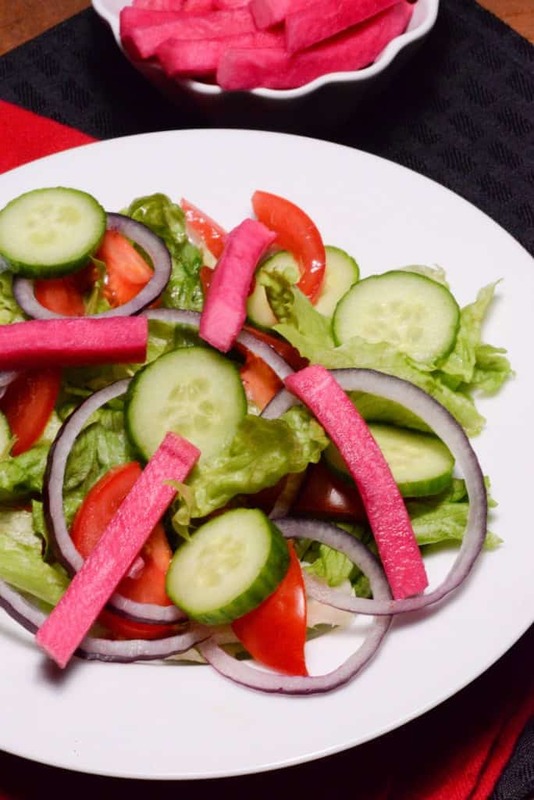 The salad was a typical green salad; made with romaine lettuce, tomatoes, cucumber and onion, then dressed with a bit of lemon juice and oil. What made it so special, was adding the pickled turnips. (I am now officially in love with them.) They are crunchy, salty, wonderful tidbits that have a bit of an earthy flavor, from the beets with which they are pickled. The color is a bright pink. They are found as a side dish on most tables, throughout the region. For the main dish, (since we had already made the national dish, machboos, for Bahrain,) we prepared a dish called Murabyan, also extremely popular there and made with rice and shrimp. The rice was first sautéed with onions and then, tomatoes and shrimp. A topping was added made from all the Arabic seasonings one would expect, along with more shrimp. 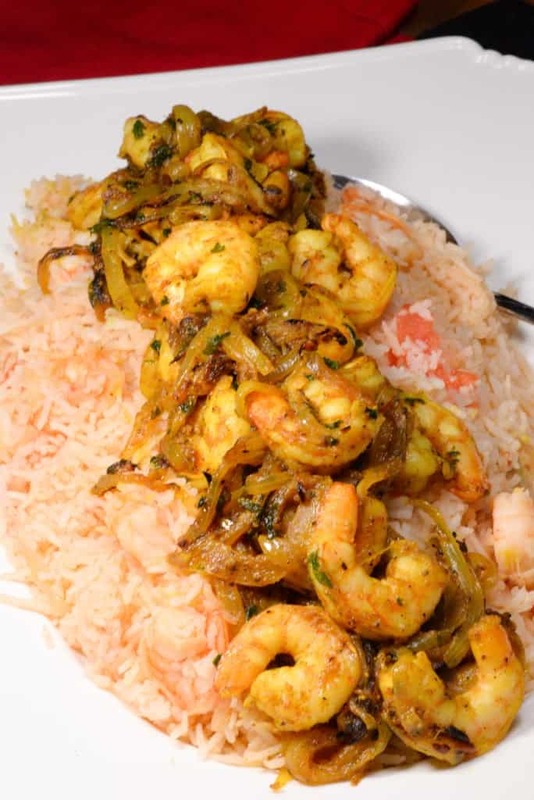 The result was a lovely, spiced, shrimp and rice dish that was totally satisfying. For dessert we made a vanilla custard, (perhaps an influence from the British friendship), called elbah, which was served cold. It would be perfectly refreshing on a hot, Kuwaiti, summer day. What made it Kuwaiti, was the addition of cardamom and saffron. We enjoyed it with a hardy cup of Arabic coffee. p.s. 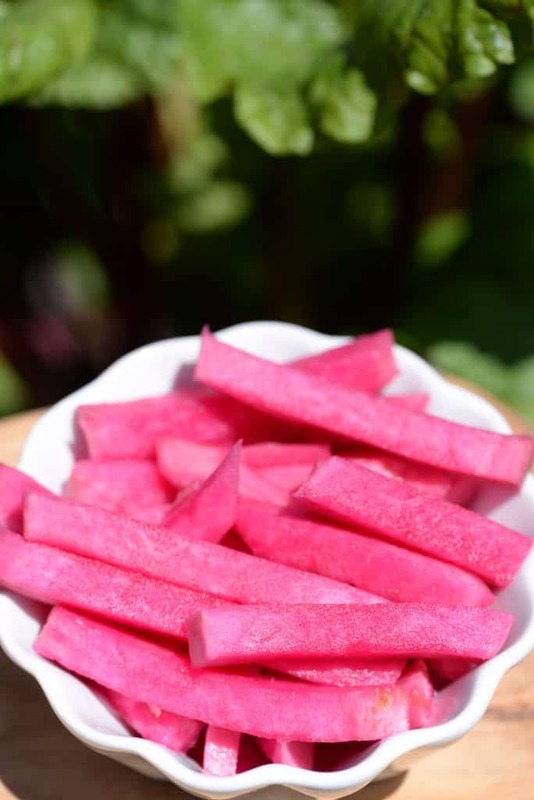 Have you ever tried those bright pink, pickled turnips?